Technology is certainly changing our daily lives and the world we live in. Check out this article where TaxiFareFinder is highlighted as an innovator within the taxi industry by using technology to benefit both drivers and passengers. Taxis are plentiful in Chicago and are generally fairly easy to find and hail. Hailing a taxi is the same as it is in most cities; you simply step out onto the curb and raise your arm when you see a taxi advancing. The taxis in Chicago do have roof lights to indicate whether or not they are available (light on means the cab is available) but it is widely known that the cab drivers rarely use this system. 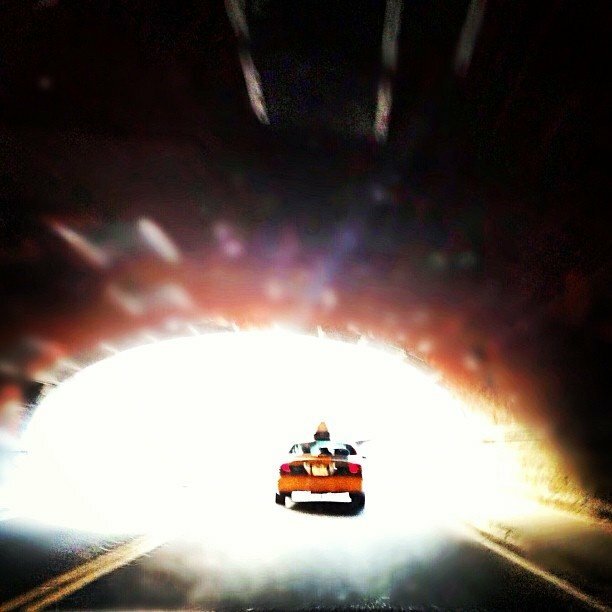 Many natives of Chicago will tell you to try to hail a cab regardless of what the roof light indicates. If you would rather not hail a cab or are having difficulty try walking to a nearby major hotel or train station. You will often find cab stands at or near these places. If you can’t find a cab stand try giving a hotel doorman a few dollars to hail a cab for you. 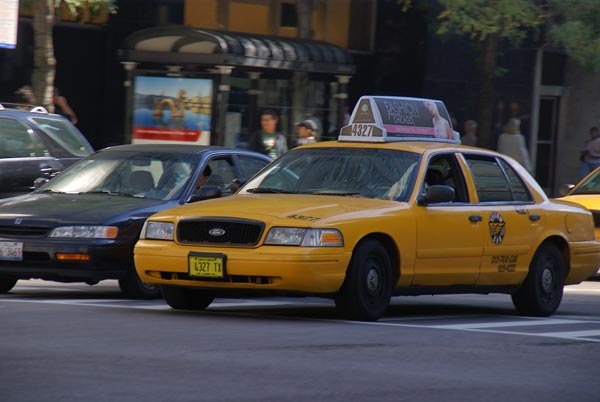 While cabs are plentiful in Chicago if you are in a suburb or a more residential area of the city you will most likely have a hard time finding a cab. In this situation it is best to call a local cab company to order a cab. The rates in Chicago are $2.25 for the first 1/9th mile, $0.20 for each additional 1/9th of a mile, and $2.00 every 6 minutes for waiting time ($20 / hr). These rates are charged within the city limits of Chicago only. If you were to travel outside of Chicago to the suburbs you will be charged the metered rate and a half or 50% more. Trips from Chicago are charged at the normal meter rates to the city limits and then from the city limits to the destination the meter will switch to 50% more. There is no extra charge for baggage or credit card use. If you’re sharing your cab, there is an additional $1 charge for the first person. For each passenger after that, there is an additional $0.50 charge. To compensate for rising gas costs, a surcharge of $1 is added to all fares when the average price for a gallon of gas exceeds $3.20 in the Chicago area for seven consecutive business days. You are responsible for any tolls. Should you tip your driver in Chicago? Yes, the standard tip is about 15% of your total fare. If your driver helped you with your baggage as well you can add an additional $1 to $2 per bag. Are cabs more expensive than buses or trains? Yes, you will find that a cab is more expensive than the public transit system but most destinations in Chicago are in what is known as “The Loop” and they are all a relatively short distance. Due to this your cab fare might be cheaper than envisioned. Do Chicago taxis accept credit cards? Some cabs have credit card machines but not all so it is definitely wise to carry cash on you or ask your taxi driver ahead of time. How many taxis are there in Chicago? 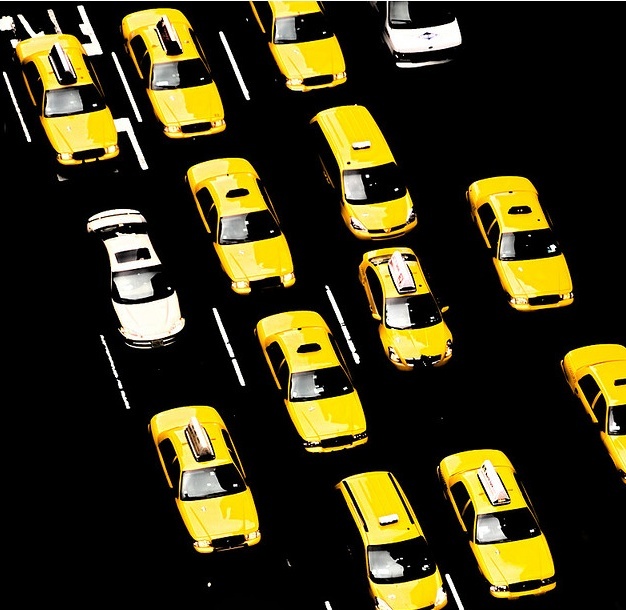 There are currently 6,951 taxis in Chicago. 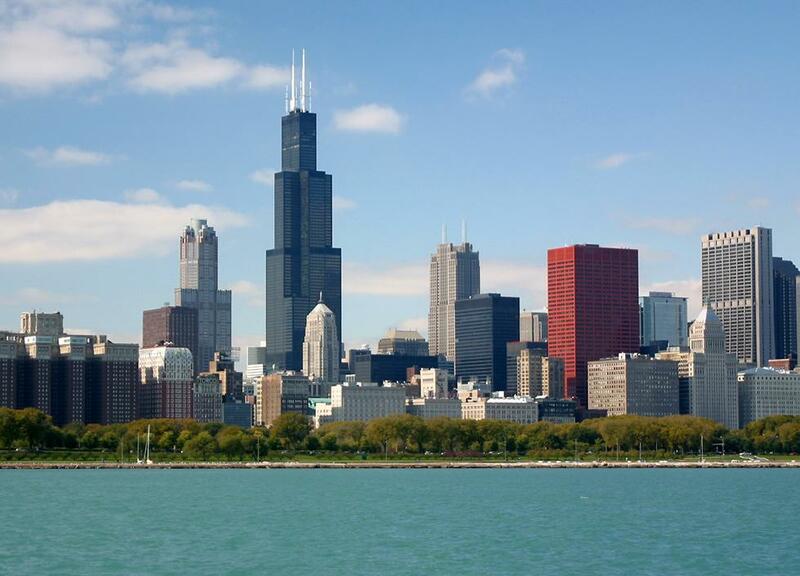 There are two main airports servicing the Chicago area. Most cabs will charge flat rates from both O’Hare International Airport and Midway International Airport. These rates will typically be posted in the cabs. Taxi stands are located on the lower level curb front of each terminal. Only accept taxi rides from taxis in line at the stand as these are the only licensed taxi drivers at this airport. Your taxi driver will either charge you a flat rate or will have a working meter to calculate the fare. An average fare from the airport to Chicago city center is about $28-$35. Taxi stands are located at the lower level curb front (outside baggage claim) at each terminal. It is advised that your use these stands to ensure that you get a licensed taxi driver. Do not accept rides from drivers on the departure level (second level) of the terminal roadways as they are not licensed. Your taxi driver will either charge you a flat rate or will have a working meter to calculate the fare. An average fare from the airport to Chicago city center is about $30-$40. If you run into a problem with any taxi in the Chicago area make sure you get a receipt which should show the driver’s company, name, number, and distance of your trip. Then you can call city services by dialing 311 from any Chicago land line and file a complaint. Are you looking to grow your taxi company, increase revenue, and gain new and loyal customers? If so, then look no further, we have compiled a list of the top tips that will help you start or grow your taxi company. Word of Mouth is one of the biggest proponents of marketing that owners and managers tend to overlook. There is nothing greater (and more successful) than having a happy customer who recommends your company to all of their family, friends, and coworkers. Taxi companies can really thrive on word of mouth marketing as they provide a service where safety is an issue, something most potential customers will ask their friends about before calling your company. In order to make sure your taxi company is benefiting from positive word of mouth marketing I would strongly recommend spending a few days actually working in your business and not behind your desk. Spend a day answering the phones and driving the cabs, talk to the customers and get to know their thoughts and feelings on your company. Have they had any disputes recently or heard any negative feedback? Is there something more that your company can do to make them enjoy their ride? Customer feedback is very important in the taxi business and you will learn so much more about your company and what areas you can improve. Plus the customer will enjoy feeling as though their thoughts and ideas are being taken seriously! Another strategy to garner great word of mouth marketing is referrals. This is one of the most powerful ways to get new customers. Most loyal customers will refer your taxi service to friends and family simply to be nice and show their appreciation. Plus most people love to brag and look smart in front of their friends when they find an awesome product or service. However, a great way to boost referrals from all your customers is to offer a type of reward system. You can give away virtually anything in return for referrals such as gift certificates for future taxi rides or fun prizes and useful items. You can even partner with businesses in your city and give out local gift cards for their shops or restaurants. Any type of reward will motivate your customers to tell their friends about your company and a customer that refers a lot of their friends is a great asset to your company. If you do choose to ask your customers for referrals and don’t have the money to offer a reward program yet, try writing a thank you note to that customer so they feel welcomed! If you never acknowledge a customer’s referral the customer will most likely stop referring people to your business. Direct marketing is one of the easiest and cheapest ways to market your taxi company. A simple way to directly market to your potential customers is through business cards. Place your business cards in populated areas where people might need to call for a taxi, such as, supermarkets, shopping malls, bars/restaurants, and hotels. You can also hand out your business cards to your customers at the end of each ride; most people who take taxis will need to be picked up again at the end of their stay. You could double your money per customer as most people will call you for their ride back home as long as their ride the first time was enjoyable. While hanging fliers and garnering word of mouth advertising can be very effective, the online community has engulfed our society. Online advertising is a fairly simple concept, you want to find the websites that your potential customers will go to when looking for a cab. 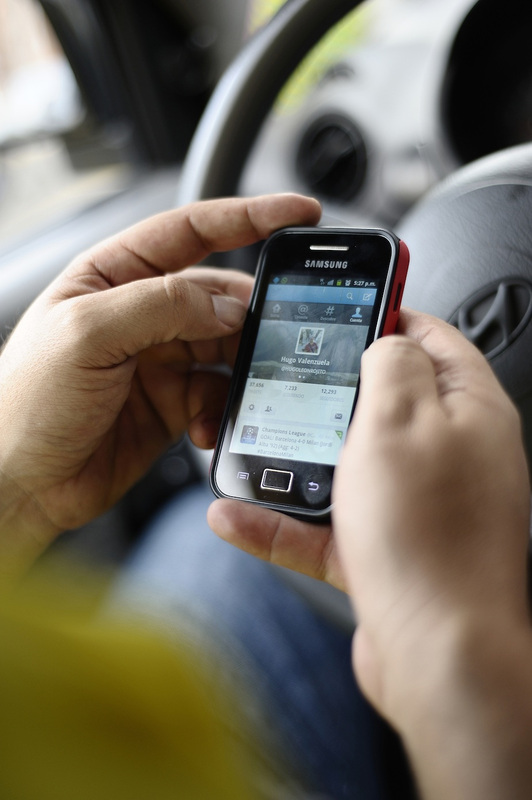 Then you wa nt to make sure that your company and your dispatch number is listed on those websites to make it easy for potential customers to call your company for a ride. For example, TaxiFareFinder.com offers a taxi listing service on each of our city calculator pages. If you list your company on your cities calculator page you know that every person who looks up a taxi fare estimate in your city will see your name and number to call. This way you are making sure you aren’t wasting your money advertising to people who will never visit or live in your city; you are able to get your name and number directly to your exact target market. Many companies will make the mistake of listing their number on a website that has a broad target market and they will waste a lot of money marketing to people who will never need their services. Having an up to date and easily accessible website is very important for any taxi business that is trying to grow . You want to make sure all of your information is readily available for anyone who is searching online for a cab company in your area. It is also a good idea to make sure your website looks professional as an unprofessional or unorganized website can turn people away from using your business. It is also a good idea to list any flat rates or special deals you offer to major airports or popular tourist destinations. Many people when searching for a cab are looking for the best deal to transportation hubs or points of interest. If they find a good deal right away they are less likely to keep searching for other companies. Here at TaxiFareFinder, we aim for complete satisfaction not only with all of our users, but with all of our advertisers. We ask all taxi companies who advertise on our website and mobile application to complete a survey about their experience and the results of advertising their company’s contact information on TaxiFareFinder. Our survey of Henry’s Cab Service in Texas is an awesome example of the benefits that listing your cab company on TaxiFareFinder can provide. 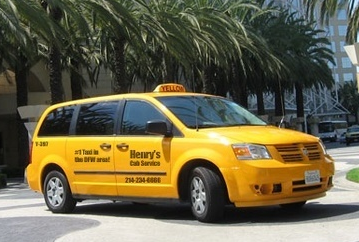 Increased national exposure as well as new untapped customers are two huge advantages Henry’s and with many other taxi companies have already experienced. You can find the survey completed by Henry’s Cab Service below. What is your taxi company? What role do you play? Henry’s Cab Service. I am the marketing campaign manager. Can you tell us a bit about your taxi company? What areas do you cover? We are a small taxi company that is dedicated to providing customers with the highest level of service. We cover most of the Dallas-Fort Worth, Texas area. Can you tell us how you first heard about TaxiFareFinder? I did a Google search for “Taxi Prices Dallas, TX” and TaxiFareFinder came up first on the list. Do you recommend TaxiFareFinder to your customers? What is a common reaction? We do recommend TFF to every customer. In addition, we have the website stamped on the back of every business card. The common reaction is amazement that such a useful and accurate taxi pricing tool is available. You decided to list your taxi dispatch number on TaxiFareFinder’s Dallas and Plano page. How did this help your business? 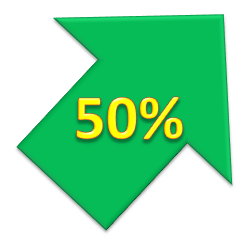 Our business increased by at least 50% almost immediately, and has remained steady ever since. In addition, our customers put a greater faith in our integrity, since we can not only show them what the price SHOULD be before the ride, but also show them how to figure it for themselves. Did you see increase in your ridership? If so, how much? We saw an immediate increase in ridership of at least 50%. Do you have a word for other taxi companies? Of all the places on the internet to list your company, TaxiFareFinder is one of the, if not THE, best. Not only does it direct more customers to your business but it also gives the customers peace of mind that your prices are fair and correct. We would like to thank Henry’s Cab Service for allowing us the publish these responses and for their support. We are happy to have such a beneficial relationship! If you are interested in learning more about TaxiFareFinder advertising opportunities, please visit this page. Thank you! 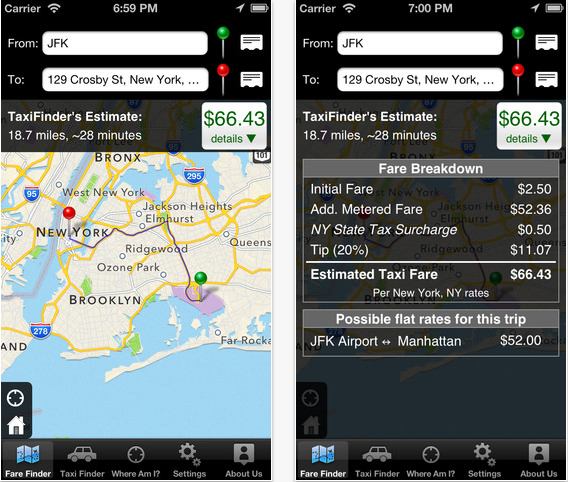 TaxiFareFinder is excited to announce that Version 2.1.2 is now available for the Taxi Finder iPhone App. Version 2.1.2 includes multiple updates and improvements including integration of the iOS7 platform. Users will find that the app has a new look and feel consistent with iOS7. We have also applied performance enhancements and fixes applicable to iOS7. Taxi Finder is a user friendly iPhone application that calculates taxi fare estimates and locates local taxi companies for hire. Taxi Finder allows users to calculate fare estimates from any two defined points with the click of a button. Once a fare is calculated, the tool provides route and duration details as well as contact information for taxi companies in the area. With over 600 cities supported worldwide and thousands of points-of-interest, Taxi Finder is able to provide precise estimates around the globe. Download this new and improved iPhone app here.